Good color contrast plus the reds in the poppy are very finest. more than well deserved award dearest Srna for this wonderful image and fine lyrics!!!! Hearty congratulations on your so well deserved Award, bravo my dear Srna. Congratulations, deserved award Srna for such a beautiful work. against that beautiful sky, amazing! Beautiful contrast with stunning visual and initial impact. Love the framing with the green grass/stalks. Wonderful color saturation and excellent camera technique. Great technical excellence Srna. Its another winner girl! And I have not noticed "Also the colors of Serbia (Luczica) = Lausitz :)" and that means "The Beauty is in the eyes of a viewer" my friend. A beautiful floral composition with a really good pov giving all the power to your work. Wow, what a present my old dear friend ! 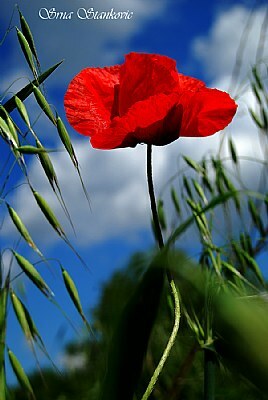 Poppy flower is already poetry, fantastic capture, all senses are activated dear Srna. Beautiful flower and beautiful poem, Drna dear.